GIRISH PATEL & FRIENDS "JOURNEY OF PEACE"
By 1807 England had already been engaged for some years in a long and arduous war with France, which wasn’t to end until Napoleon’s defeat at Waterloo in 1815. As a necessity of the war several recruiting parties of commissioned and non-commissioned officers were stationed around the country raising recruits for the army. A large number of men were raised in Stroud and parties of 20-30 young men leaving the town to join their respective regiments were a common occurrence. The recruiting party was based at two houses on the east side of King Street belonging to a Mrs Hyde, widow of Frank Hyde, once the owner and driver of the Stroud and Bristol coach. After lunching together, Heazle and Delmont took a walk together in the country near Stroud. They were then on good terms with one another but in the course of their walk Delmont made some remark which displeased Heazle, though it was understood not to have had any direct personal reference to him. Nevertheless, Heazle demanded an apology for it which Delmont refused to give having, as he later said, resolved never to make an apology (no doubt founded on the idea that to do so was unbecoming of a soldier). In consequence of this refusal, Heazle demanded satisfaction and the two young men agreed to settle the difference by a duel to take place that evening. The site chosen for the duel was to be a field in a dell near a house known as The Grange. On returning from their walk Delmont sent for Lieutenant John Sargeaunt who was then at a dinner party at The Grange, residence of George Wathen. On his arrival Delmont and Heazle told him what had happened and asked him to accompany them to the field they had chosen for the duel. Sargeaunt made an ineffectual attempt to reconcile them before, unwisely and unfortunately, acquiescing. He then went with Heazle into the town to procure pistols, powder and ball, while Delmont waited for them in the neighbourhood of The Grange. There was much delay in procuring the pistols and shot. Heazle and Sargeaunt decided to concoct the story that they wanted the pistols to shoot at a target for a bet for a dinner and wine. At about six o’clock Heazle called on the bookseller and publisher Samuel Jenner, asking to borrow a pair of duelling pistols; but Jenner had none. At about the same time Sargeaunt went to Thomas Howell, landlord of the Green Dragon Inn in King Street, who was also a blacksmith, and asked if he had any pistols. Howell showed Sargeaunt a horse pistol that he had which had once belonged to someone in the volunteer cavalry; but it was too large and was foul and rusty. Sargeaunt then went to Jenner’s house only to find that Heazle had already tried him, to no avail. At about seven o’clock, Sargeaunt returned to Howell’s and said that the horse pistol he had shown him would have to do, but he would need another pistol to go with it. He told Howell that if he won the bet the dinner and wine would be had at the Green Dragon. So, Howell sent one of his workers, William Hewlett, to go and try to find a second pistol; which he managed to do by borrowing one from Partridge, a confectioner, who lived at the upper corner of the lane which became Bedford Street. This pistol was similar to the other but was clean and in better condition. With the help of Mrs Howell and her two children, two bullets were located in a drawer upstairs in the Green Dragon, and saying, “I’ll make these do,” Sargeaunt dashed out of the Inn. While Sargeaunt had been procuring the pistols at The Green Dragon, Heazle had returned to Delmont and they were seen sitting on a low wall near Badbrook House playing with a dog and trying to look as inconspicuous as possible. Meanwhile, Hewlett’s curiosity had been aroused and he followed Sargeaunt from The Green Dragon. After losing sight of him for a while he later saw Sargeaunt emerge from the entrance court of The Grange and go down a lane to join up with Heazle and Delmont. The three of them then went into a nearby field. Sargeaunt was in his regimentals but the other two were in plain clothes. At the same time a labourer by the name of George Bryant was going to mow barley in an adjoining field. On seeing the three gentlemen he ran down to look at them over an intervening hedge. When they saw him one of them asked him roughly what he wanted, and then told him to mind his own business or they would shoot him. About 10 minutes later a pistol shot was heard by Bryant and Hewlett, and also at The Grange, and shortly afterwards Heazle and Sargeaunt ran from the field in great consternation. Heazle ran off down a steep path from The Grange to Badbrook towards Stroud where he bumped into the surgeon, Mr Sweeting, whose attendance had previously been requested, and told him he had been coming to fetch him as he had shot “poor Delmont”. As Sweeting headed for the field, Heazle continued on into Stroud and was later seen in the yard of The White Hart Inn where his sergeant was billeted. That was the last time he was seen in Stroud, having been believed to have then set off on foot along the tow path of the Thames and Severn canal on towards Cirencester and thence to London. Meanwhile Sargeaunt had run to The Grange and told the owner, George Wathen, what had happened. He then rushed back to the field where Sweeting found him on the ground supporting Delmont who was bleeding profusely from a wound in his left side where a bullet had passed through. Sweeting immediately knew that it was a serious injury. While Delmont was being carried back into town, Sargeaunt returned to The Grange from where he sent word to Howell to have his clothes chest brought to him. He then took off his regimentals and, as night fell, he left on horseback for Cirencester and so escaped. When Delmont reached his lodgings in King Street he expressed a conviction that the wound was mortal and earnestly requested that the Rev John Williams, the officiating minister of the parish, should be sent for. When Williams arrived Delmont asked to partake of Holy Communion. Before granting his request, Rev Williams asked him about the temper of his mind. Delmont duly spoke of much pity and forgiveness towards those implicated in the crime, and of contrition and sorrow for his own rashness. Rev Williams then administered the Sacrament, which Delmont received with much composure and devotion. On an examination of his wounds by Sweeting and other local surgeons it was found that a bullet had entered Delmont’s left side and passed through his body, coming out at the chest, and had also wounded his left arm. This discovery caused great surprise and a difficulty in understanding how it could have happened, unless he was left-handed and had stood in a corresponding position with his left side to his antagonist. On being questioned about this Delmont said that they were placed back to back and directed to advance six paces, then turn around and fire. But he was shot before he had turned around. On being asked by Rev Williams the cause of the whole affair Delmont replied that during the course of their walk he had made some jocular remarks which Heazle had taken too seriously, but that his own pride would not allow him to apologise for. Williams stayed at Delmont’s side throughout the night. As the night advanced his sufferings increased and under pressure of pain and anguish he cried out, “Oh! This is agony! It is as if a thousand pen-knives pierced me; but what are my agonies compared with the agonies which our Lord suffered for us?” To which Rev Williams replied, “They are indeed but light afflictions, nor are the agonies of the body to be compared to the agonies of the mind.” To which Delmont said in a low and tremulous voice, “Oh! No; and that is what I feel – I have been very rash – I have been very foolish.” Rev Williams consoled him, to which Delmont said, “I am thankful – I cannot express my feelings,” after which he was more composed, with Rev Williams frequently praying for him. He also expressed great anxiety, tenderness and respect for his parents, and particular concern over the effect the news might have on his father, who had already lost an elder son in a duel in Malta. He frequently exclaimed, “How will my father support it?” and “How will my mother receive the tidings? – when I think of my mother, I sink into the coward.” Rev Williams told him not to think so much of his parents, but to feel for himself and resign them to a merciful providence. “It is a consolatory thought, that God is mercy,” said Delmont. On the next morning, Saturday 15th August, Delmont gave the same account as the previous evening to Barry and, in reply to Barry asking him if he was left-handed, replied that he was not, adding, “Barry, I’ll tell you how it was. We were placed back to back, and ordered to take six paces each, and then to fire. The word ‘fire’ was not given. I was shot in the back: or at least I think so.” He further said that he did not wish to see Sargeaunt punished for his part in it. On Sunday 16th August Sargeaunt made an appearance at the house of Delmont’s father at Duke Street in Westminster, London; to whom he introduced himself saying, “I am the most distressed man in the world; I am a military officer and shall lose my commission; I am without any pecuniary resources.” On being asked to explain himself he continued saying, “Sir, you have a son in the army. He has been engaged in an unfortunate duel, in which I was the second, and the only second.” And in answer to an inquiry as to whether he could have accommodated matters, said that he had done all that he could have done. Sargeaunt then left the house, promising to return at a later date; but he never did. On the morning of Tuesday 18th August Rev Williams was again visiting him. As soon as he arrived Delmont said to him, with much penitence and humility, “I have done nothing but ill all my life.” Rev Williams replied, “I am glad to hear that you are sensible of your follies; but if God had mercy upon a bloody-minded Manasseh, if he shewed pity to an adulterous Magdalene, if he extended favour to a persecuting Paul, if he had compassion on a dying thief, why not on you? – there is much room for hope.” Delmont replied now with all the strength and energy that his feeble powers could summon, “I hope with confidence.” He continued trying to speak but his speech became very indistinct and unintelligible until, after a few more minutes, he finally expired. It was later said that nurse Mennie had given him a lotion which was intended for bathing the wounds instead of the draught he should have taken, and that this had produced a new internal haemorrhage which probably accelerated his death by a few hours. His father arrived from London too late to see him alive. On the next day, Wednesday 19th August, a coroner’s inquest was held with Richard Rickards of Farm Hill as foreman of the jury. After hearing the evidence, and listening to the opinion of various medical gentlemen that Delmont had died from a wound in the chest, the jury gave a verdict of wilful murder against Heazle and Sargeaunt. On the following Sunday the Rev Williams preached a funeral sermon on the pernicious vice of duelling from the text of Romans 12.19, in which he detailed some of the particulars of the deceased, and of conversations with him before he died. The sermon was later published by Samuel Jenner and raised such excitement that a second edition was required a few days later. The parish officers subsequently put advertisements into the Hue and Cry and in the provincial newspapers, describing the persons, dress, and so forth, of the two culprits, Heazle and Sargeaunt, now being sought, and offering a reward of £20 for the apprehension of either of them. The attorney of the parish was, moreover, prepared to prosecute them at the next County Assizes should they appear there to take their trials under the verdict of the coroner’s inquest; but they never appeared. Thenceforward, their names were removed from the army list. As to the pistols, the rusty one which was borrowed from Howell and allotted to Delmont was discharged after the duel, but not without difficulty. The other was forfeited as a fine to Thomas Croome, lord of the manor of Painswick, in which the fatal field was situated. It in turn passed onto his grandson, Thomas Myers Croome, lord of the same manor. It was said that Heazle died in the West Indies soon after his escape. Sargeaunt fled to America from where, after some years, he returned to England once, in secret, to see his aged father whose only son he was. He then returned to America and died in exile just as his friends were hoping to obtain his pardon. The Grange has long since been demolished and replaced by housing, but the site of the duel is in the grounds of a home appropriately called Dueller’s Rest in Folly Lane. The main source for the story is Paul Hawkins Fisher’s Notes and Recollections of Stroud, first published in 1871. The Fisher family is represented by a memorial on the west wall of St Laurence, just to the right of the tower screen. 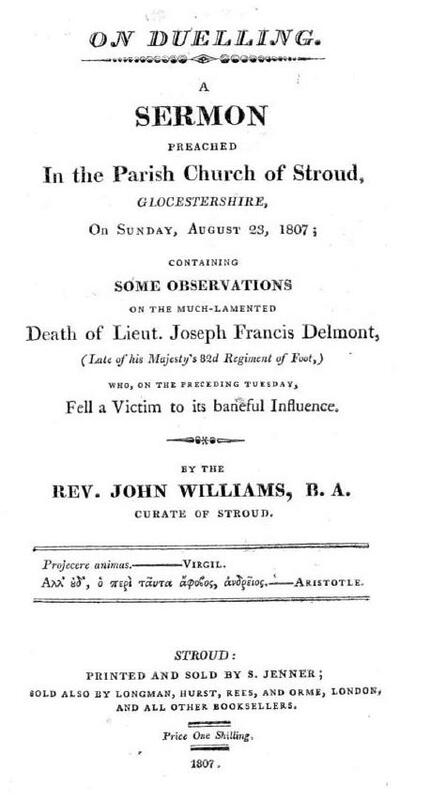 Rev John Williams’ sermon On the Pernicious Vice of Duelling was published by Samuel Jenner of Stroud in 1807. ​Copyright © 2019 Andy Evans/St Laurence Parish Church. All Rights Reserved.